Back in February seven Baltimore Police officers from the department’s gun task force were indicted on federal racketeering charges with allegations that the officers extorted and stole money from citizens, falsified police reports and collected fraudulent overtime payments. While all of the cases are still pending, it is now expected that four of the officers will enter guilty pleas sometime in the near future. The other three officers though appear to be in more hot water after the U.S. Attorney’s Office announced a federal grand jury returned a new indictment last week. The superseding indictment charges the three officers with additional counts of robbery, conspiracy, and possession of a firearm in furtherance of a crime of violence. All told the offers were implicated in as many as 13 robberies that yielded over $280,000 in cash, firearms and 2 kilograms of cocaine, and now the details of some of these criminal acts are coming to light. The new six-count indictment alleges that as far back as 2011 the officers illegally detained or entered the homes of suspected drug dealers with the intent to steal their narcotics and money. The officers allegedly conducted traffic stops without probable cause and even went as far as swearing to made up search warrant affidavits to gain access to suspects’ homes and vehicles. There are also allegations of burglarizing a storage unit to carry out a cocaine theft, stealing 20 pounds of marijuana during a drug deal and robbing a stripper. The incident that is gaining the most media attention though was a brazen home invasion robbery where the officers hired two civilians to steal a large amount of cash from the owner of a pigeon store in the southern Baltimore neighborhood of Brooklyn. While conducting a search warrant on the store the gun task force officers learned that the owner was in possession of $20,000 cash that was to be used to pay off a tax debt to the IRS. The officers left the store without taking any money, but later conspired with two civilians to steal the cash at a later date. After locating the store owner’s home address using a law enforcement database the officers provided the address as well as tactical gear including bullet proof vests and weapons to the civilians. The two civilians then robbed the store owner at gunpoint after posing as cops attempting to execute a search warrant. The store owner reported the incident to the Baltimore Police several times, and filed an internal affairs complaint to no avail. While there was no official word from BPD on what exactly happened with the IA report, it is now assumed that the investigation was turned over to the feds in order to continue to build a case against the corrupt city cops. All seven of the officers face up to 20 years in prison for the racketeering and conspiracy charges and some may face additional penalties for robbery and felony firearms offenses. The firearm offenses could trigger mandatory minimum sentences as well, so it will be interesting to see what type of plea deals the first four officers agree to accept. The Blog will continue to follow all of these cases and may post a follow up article in the near future with an update. If you or a loved one is facing state or federal criminal charges contact Benjamin Herbst. He has represented hundreds of defendants charged with gun crimes, robbery, theft and drug trafficking and is available anytime for a free consultation. 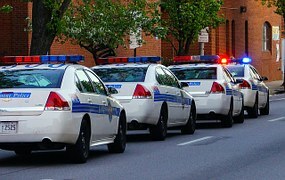 Indicted Baltimore City Police Officers Charged With Additional Robberies, www.justice.gov.